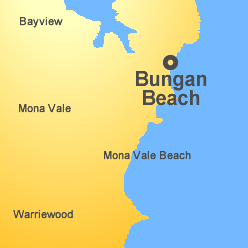 Bungan Beach, situated between Mona Vale and Newport, is backed by dunes and littoral rainforest. Beach dunes are fragile environments. High tides, storms surges, illegal clearing, inappropriate plantings, trampling, and other depredatory uses all contributed to a widespread loss of the original vegetation on this beach. The Foundation has been supporting the Friends of Bungan Beach to undertake bush regeneration along the dunes and rainforest since 2007. The Foundation’s work continuing on this project has been supported by a yearly donation from a private Pittwater resident. This ongoing contribution, a strong indicator of community support, has attracted further grant funds. Other private donations for this project could add to the successes already achieved. ‘There are many ways to help. Bequests and donations remain our primary source of funding. 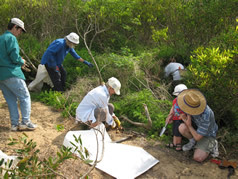 Becoming part of a bushcare group on site or joining in the community planting days are another way of contributing directly to the success of this project. Finally, simply appreciating the work by enjoying a walk or birdwatching through this bushland is a great start to supporting the work and the benefits for us all. You can materially assist this project by becoming a Friend of the Pittwater Environmental Foundation and nominating this project as your special interest. Visit the Friends page.